Twenty-four people were killed and 150 injured in Cairo yesterday during the most violent scenes to hit the country since February’s revolution ousted ex-President Hosni Mubarak. Reports said trouble escalated after Christians, protesting an attack on a church, threw rocks and petrol bombs and set cars on fire as they clashed with military police. Gunshots and the sound of exploding tear-gas canisters rang out across the centre of the capital amid chaotic scenes. Thousands of people, some hurling stones and petrol bombs, charged through Tahrir Square as protesters fought battles with soldiers and riot police. The violence started after demonstrators from Egypt’s Christian community headed towards the state television building in central Cairo late yesterday afternoon. 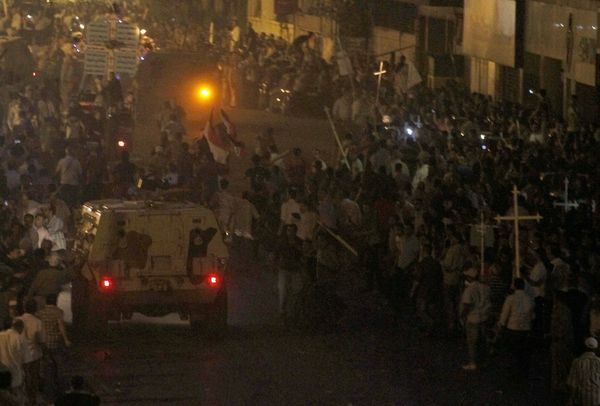 The protesters, who began their rally from the Shubra district of northern Cairo, were hoping to start a sit-in outside the riverside TV complex to highlight grievances within their community – something Egypt’s Copts have done numerous times in the past without trouble. But, according to witnesses, they came under attack from men in plain clothes who started hurling stones at them. Not long afterwards gunshots rang out at the scene. By around 7pm central Cairo was boiling over with angry protesters as thousands of youths fought running battles with the police and gangs of regime loyalists. At the northern side of Tahrir Square, close to the Egyptian Museum, the road was littered with rocks and broken glass as young men launched missiles at scores of plain-clothed thugs standing about 200 yards away near the Ramses Hilton Hotel. One man, his head tied with a ribbon in the colours of the Egyptian flag, used an axe to bang metal railings like a war drum as more and more activists arrived at the scene. By about 9pm a tense stand-off was taking place near the state TV building as hundreds of protesters faced scores of baton-wielding riot police and soldiers. Nearby, on 6th October bridge, which spans the Nile close to the Ramses Hilton Hotel, scores of onlookers had gathered to watch. The sudden explosion of violence will raise fears that Egypt’s uprising – already labouring under the weight of myriad concerns – has foundered. Last month the ruling military council, which took power after Hosni Mubarak was toppled in February, said it would be reintroducing the much-hated Emergency Law following an attack on the Israeli embassy. Many activists will be worried that last night’s violence will offer the generals even greater reason to implement martial law.